NEXT WEEK: A Ribbon Cutting With Mayor Mike! 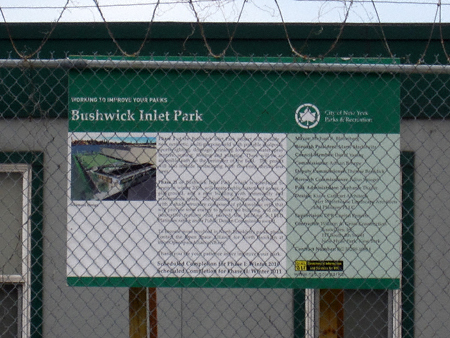 Some of you probably know ground has been broken for the new soccer field which will grace Bushwick Inlet Park. What you probably do not know is (per a most curious anonymous source) I have been told there will be a ribbon cutting ceremony with none other than our fair Mayor as well as “other elected officials and Commissioner Benepe” this upcoming Monday, July 6, 2009! The festivities will kick off at either 9:00 or 10:00 a.m. (I am awaiting confirmation for all of this— if/when I get a firm time and date I will post them here.) Let’s celebrate! Time: Either 9:00 or 10:00 a.m. (time and date to be confirmed) 11:00 a.m.
Why hasn’t this event been announced to the general public, you ask? That’s an excellent question! Why not pop by on Monday and ask Mayor Mike and/or Mr. Benepe in person? 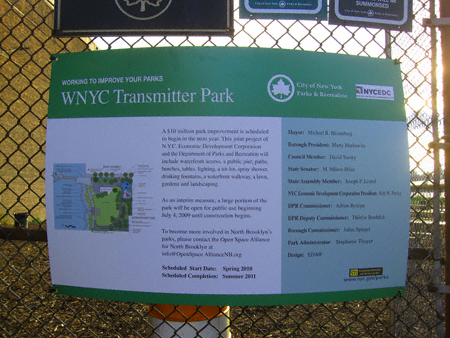 *Or would that be WNYC Transmitter Park? As you can see in the following photographs (taken at 7:30 this evening) the stage is being set for something to go down there. Soon. 8 Comments on NEXT WEEK: A Ribbon Cutting With Mayor Mike! Damn, I have an appt at that time in the city! Otherwise I’d sooo be there. Well that’s nice. 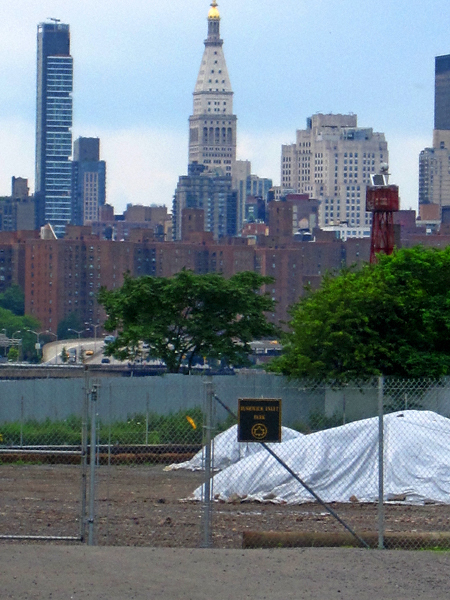 As an (ostensible) co-chair of the Friends of Transmitter Park I want to know where my invite went. Did it get lost in the mail? Maybe the McCarren DogRun Cess Pool will get have some rare orchids thrown upon the waves of mud now contained therein for the occassion?! OOOOOOOOOO!!! AAAAAAAAHHHHHH!!!! oh election time promises… its amazing how the parks are getting started right before the vote. you figure with the time table it too them to do the little park at the end of manhattan ave, these parks should be done in another 25 years. i can’t wait to see the special bloomberg mailer (and maybe a tv commerical) with all the great work he has done in our community. I went to Transmitter ( Park? ) today. 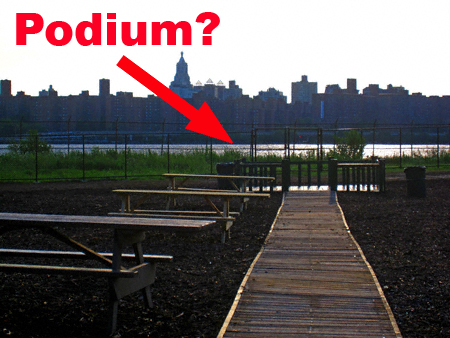 The “podium?” as it turns out is a wheelchair accessible something or other. If anyone in a wheelchair goes there, I think it’s going to be more like a ride in a mine cart. The plans for the park are posted at the entrance. Boy, have those plans changed. The wetlands in the old ferry slip are still there but it doesn’t show the pier. It only shows one pier platform. The thing about that is this … The community said yes to getting wetland in that spot primarily because it meant funding for the creation of water ( wetland ) which would go toward the pier. Not the pier platform. The pier platform is there for the future water taxi. Taxpayer money should go for the pier not toward a business. I have a number of “issues” with all of this. The first and foremost among them is the fact this “ribbon cutting” is a closed event. While I can understand there are probably issues regarding security I do not believe this is why this event is closed to the general public. It “is invite only” because the organizers want the “right” people there, e.g. ; not folks who might protest or get soused (which is not unusual for north Brooklyn— even on a Monday morning) and blow chunks on the Mayor’s Hushpuppies. I suppose the latter could be construed as a form of dissent— but I digress. Suffice it to say I believe this is to be a campaign event/photo op— and little more. Secondly, my feelings about what is being done at Transmitter are mixed. While on the one hand I suppose it is nice that it will be open to the public, albeit temporarily, the fact of the matter is ground was supposed to be broken this year. Now this isn’t happening. I guess I’d rather wait and have the park open in some state resembling the plans than have a dozen or so picnic tables and a bunch of bark scattered about the place. Which brings me to points #3 & #4. Point #3: Personally I found the original plans for Transmitter a bit overblown. This is why I didn’t object to them being scaled back a tad. Hell, it could probably be scaled back a little more without any real detriment to the site or the planner’s vision. HOWEVER, there is a pretty wide gulf between what is there now and what we have been promised. Claiming this park is “opening”, therefore, is deceptive. It is going to be open temporarily during the summer (which I would presume to be, anyway) a prime time to get this park started. This strikes me as being wasteful. Point #4: While I understand— when all is said and done— the city will have the final say regarding how this park (or any other, for that matter) will be designed, e.g. ; what fixtures are in place, accessibility requirements, etc. There are regulations, codes, etc., that need to be adhered to. I understand this. What irritates the crap out of me is the disconnect/lack of meaningful dialogue between the powers that be behind these projects and the community at large. It has been purported that the community has some “say so” with the design of this park (or the others parks hereabouts). This has not been my experience. The “decisions” allotted to the community to make have been nominal at best. For example: at India Street there was a choice between two types of park benches: 1964 World’s Fair or 1939 World’s Fair models. This is not what I consider to be soliciting meaningful input. In regards to Transmitter, the “mine cart ride” as you call it, is not a good idea. Nor is having the main entrance on Kent Street. No one I know on the committee thinks this is a good idea (go to Kent west of West Street on any given day— or preferably NIGHT— and you’ll understand why). Yet it stands. I guess that’s my biggest beef: there are unilateral decisions being made— many of them— and yet it is purported there is significant community involvement. I cannot help but feel our public servants have forgotten who they are accountable to: it isn’t the Mayor, it’s us. So it goes. 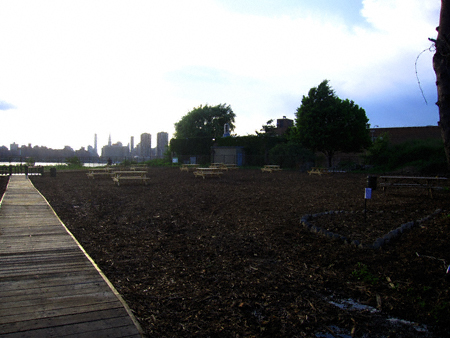 When I want to go to a “nice” park I’ll head to Grand Ferry (my favorite) or Gantry in LIC.